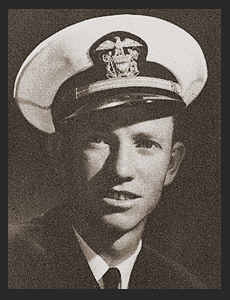 Lt. Tommie A. Cooper, Jr., son of Mr. and Mrs. Tom Cooper, graduated from Frederick High School, attended LSU and Southwestern Tech., Weatherford; husband of the former Murie Linville. Entered the Navy in Oct. 1940, trained in Kingsville, Corpus Christi, Texas, Lake City, Fla., Atlanta, Ga., uford, S.C.; served in Attu, the Aleutians; was discharged in Nov., 1945. Awarded Air Medal, Pres Unit Citation, Asiatic Pacific Ribbon.